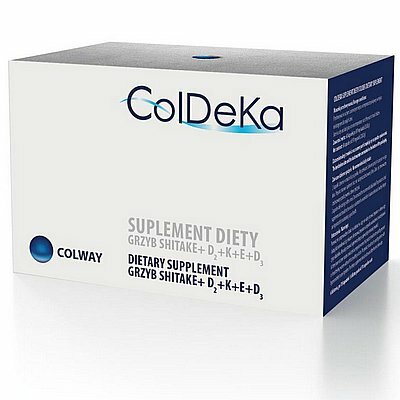 ColDeKa is a dietary supplement based on the extract of Shiitake mushrooms standardized on the contents of polysaccharide and Saccharomyces cerevisiae yeast extract standardized on the contents of glucan beta-D. The preparation was enriched in important for the proper functioning of the body's fat-soluble vitamins: D and K.
All the ingredients are dissolved in cod liver oil, which is a source of polyunsaturated fatty acids and vitamins D and A.
Vitamin D contributes to the normal functioning of the immune system and the absorption and usage of calcium and phosphorus, it helps in the proper functioning of the muscles, maintaining healthy bones and teeth and maintaining the proper level of calcium in the blood, and also participates in the process of cell division. Vitamin K contributes to normal blood clotting and helps to maintain healthy bones. 1 capsule daily, during or after meals with water.